Pointwise supports exporting Gridgen grid files. A Gridgen restart .gg) file compatible with Gridgen Version 15 can be exported from Pointwise. © – Pointwise supports importing Gridgen database files. Any Gridgen restart .gg) file from Version 15 is supported for import into Pointwise. Note that 2D blocks are not supported by Pointwise and will not be imported. SPR Import was causing the interior points of a unconstrained pole within a Gridgen quicksave file to be projected onto a nearby database surface. SPR Resolved a bug which kept Gridgen from checking for duplicate domains if prisms were extracted from an anisotropic block whose database was not present. March Resolved a bug which was causing the import of files into V SPR Fixed a scripting bug that caused true intersections to fail if the -los option was not specified for gg:: So if you create a mmanual, assign boundary conditions, but then delete the block, the boundary conditions are not lost. The application of LSQ Fit caused the database constrained end node to be pulled off grridgen database. Logic has been modified to correct how Gridgen interprets these database entities during import. SPR Resolved a bug which was causing poor results for a domain that was being copied then rotated. In Box tool for database entity selection, Vridgen was selecting more entities than those included in the box. SPR Running the elliptic solver on a domain containing periodic pairs was breaking the periodicity of the connector pairs. SPR Corrected the calculation of angle skewness for Examine. TBD There are currently no new technical issues resolved in V SPR When copy a database group for translation or rotation, groups were copied and placed incorrectly. The boundary conditions for this analysis software have now been updated. Using this tool U hot key repositions the image so that it fills the Display window in its current orientation it is centered and zoomed but its rotation is not changed. SPR Resolved a problem which was preventing a journaled Glyph script from re-executing in Gridgen. SPR Connector modifications in which the connector endpoints did not change were causing the Grldgen Linkages prompt to appear. SPR An issue was fixed that caused negative volumes to be created in an unstructured block. SPR Shell entities that were disabled and in layers that were off were being shown in browser lists as being available for picking. SPR Fixed a bug in which Gridgen crashed when joining blocks, then domains, in a certain order. SPR Resolved a bug in which the end spacings of a connector were a value different than what was specified for them. SPR A bug was fixed in which the Layer Height settings were not being accurately applied to the edges of an anisotropic domain. SPR Resolved a problem that caused the zoom box to be sluggish and unresponsive for large grids. If you import a Gridgen. SPR Resolved a problem in which applied interval shading for a database surface was not retained after the creation of a connector on the surface. March Resolved a bug in which Gridgen was unable to export the analysis boundary condition file for Cobalt. SPR A problem was resolved in which composite database and grid files exported manaul V This file did not cause previous versions of Gridgen to terminate. SPR Resolved a bug that caused the redimensioning of a connector to be journaled incorrectly from Gridgen. Prior versions of this operating system will no longer be supported. SPR Fixed a bug that was causing the wrong number of unstructured faces yridgen be written in Fluent export file headers. SPR Resolved a bug which caused Gridgen to terminate when creating a fit for a database surface. SPR The Glyph manual page for gg:: An overset tutorial on a wing-pylon geometry with a store is now available. Gridgen is now supported on SGI Prism workstations. This problem has been resolved. SPR Resolved a grixgen that was manjal periodic domains to become corrupted after connector redimensioning. SPR Fixed a bug that was causing Gridgen to exit prematurely when a particular anisotropic tetrahedral block was initialized. The axis for polar TFI may now be defined interactively rather than just by type-in. SPR Resolved a problem which was causing a different number of database entities to be reported in V SPR Glyph manual pages for gg:: SPR Fixed a problem in which Pick: SPR The manual pages for girdgen commands gg:: SPR Fixed a problem which caused corruption in a block when it was split along a pole connector. SPR Selecting Edit Dspla Fac for specific composite database and gridgen restart files was causing a segmentation violation in Gridgen. Logic has been modified to correct this problem. SPR Fixed a problem gricgen caused an anisotropic tetrahedral block to fail to initialize due to intersecting tetrahedra. The new license server in Gridgen V Improvements have been made to the performance of anisotropic triangles and tetrahedra marching off of convex regions. This new version contains improvements to the speed of the anisotropic tetrahedral mesher and the ability to mesh volumes with larger ranges of cell sizes. SPR Resolved the block re-specify issue preventing updates of block computational coordinates after a block had been saved. SPR Resolved an issue where anisotropic triangles could not be created off of a sharp edge. Logic has been added to resolve this problem. SPR A bug has been resolved which caused a grid imported into V SPR Improved pyramid collision adjustment to distribute changes more evenly on both sides of the collision. 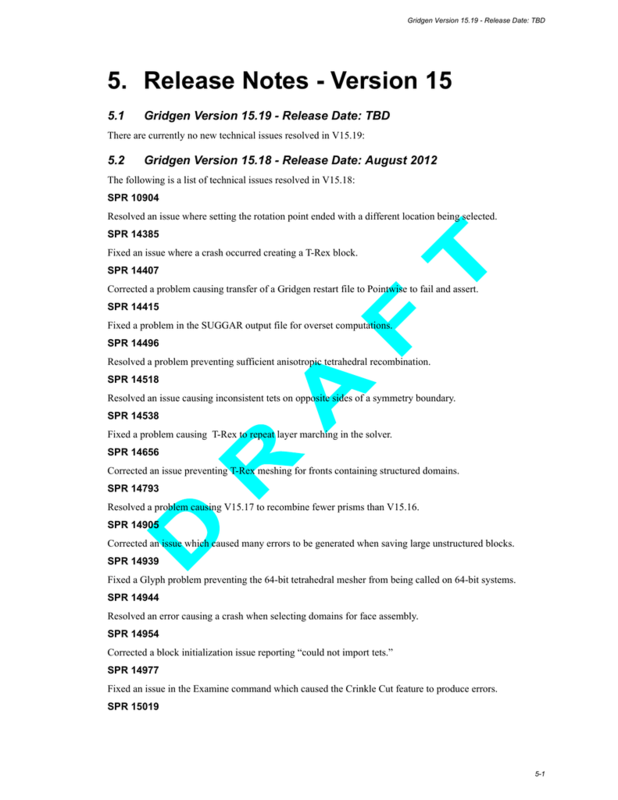 July The following is a list of new features included in V SPR Resolved a bug in which the connector information was not displayed in the Redimension Grids Blackboard when a connector was highlighted.